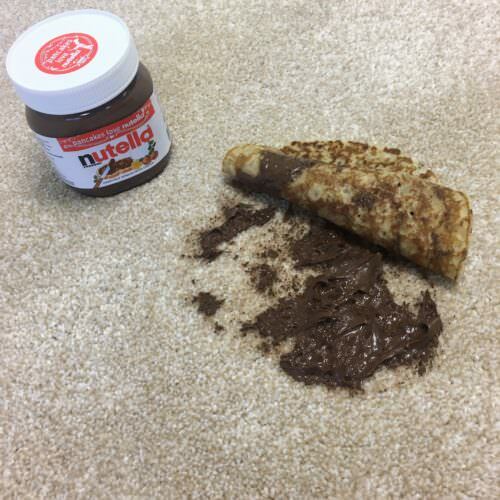 A whole host of popular pancake toppings can be bad news for your carpet. 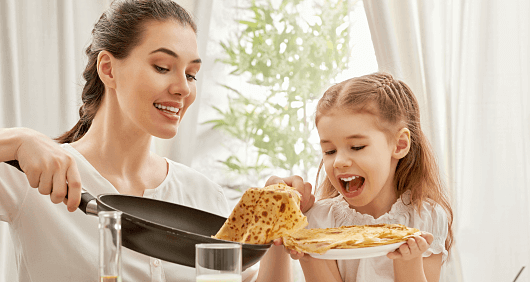 We’ve looked into the UK’s pancake topping preferences, and talked to the British Institute of Cleaning Science (BICSc) about what makes them stick. The BICSc is the largest independent, professional and educational body within the cleaning industry. Since 1961 the organisation has made efforts to raise the standards of the cleaning industry through education and training. So who better to shed some light on cleaning up pancake mishaps? What’s the UK’s best-loved pancake topping? A YouGov survey asked the respondents to pick up to three toppings they enjoy the most. Lemon and sugar was the clear winner and sits atop its light, fluffy throne with 63% of the vote! 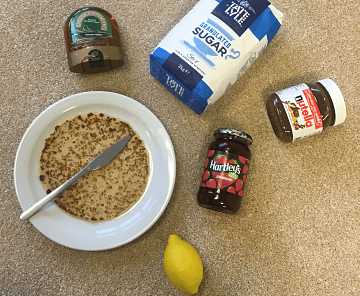 You can see a list of the UK’s favourite pancake toppings below. 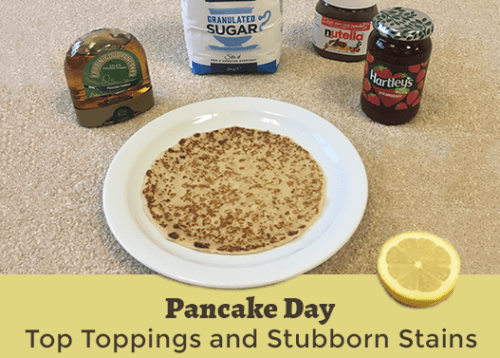 Now that we’ve found a list of the most popular pancake toppings, which does the most damage? We thought we’d try making some stains of our own. Luckily, we had a Rug Doctor on hand to clean up afterwards! The most loved topping on our list is arguably the one you’d worry about the least. So, what harm could lemon and sugar do? 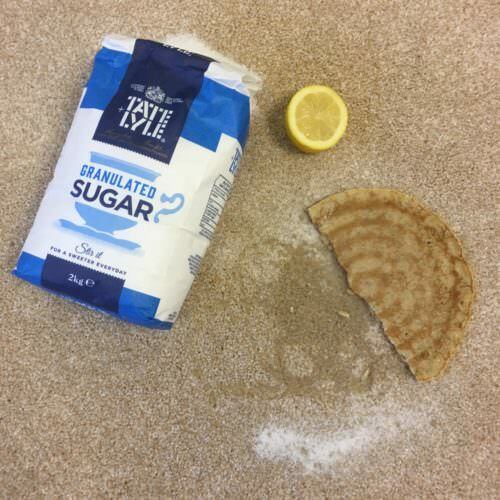 Sugar acts similarly to grit and dirt – it’s easily trodden into carpet and can damage the fibres. Sugar can also become sticky, drawing more dirt into the carpet. Citrus fruits such as lemon rarely leave a noticeable stain right away. However, as it was once used for invisible ink, we know lemon leaves a stain even if we can’t see it. The citric acid in their juice acts as a bleaching agent over time. So what’s the secret when life gives you lemons? We asked the BICSc. While this applies to most stains, it’s especially true for lemons. Act fast, before any bleaching can take place. 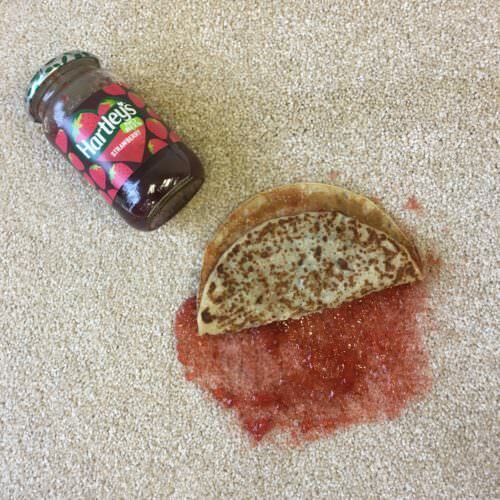 Make sure to get the fruit pulp up first, to avoid the risk of rubbing it into your carpet. Then, apply a white towel saturated with water to the area of the spill. This should help dilute the acid, and you can blot the remaining liquid away. Of course, if you have a Rug Doctor to hand, then you can make this job a whole lot easier. 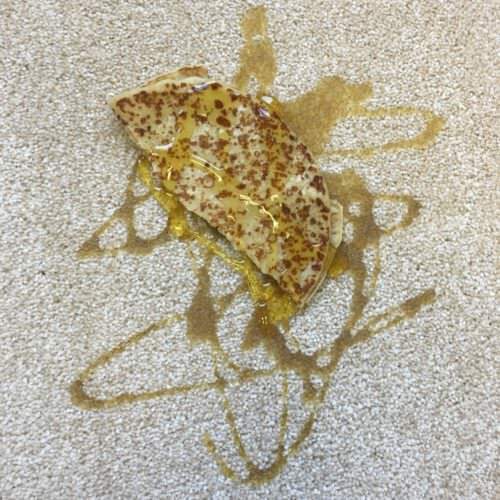 Whether maple or golden, the dangers of syrup in your carpet are all too obvious. But what exactly makes syrup stains enemy number one? If only there were a handy device that could deal with such a stain. Something that could clean deep into the carpet’s fibres, with enough suction to pull the syrup up. Don’t worry; Rug Doctor has you covered. 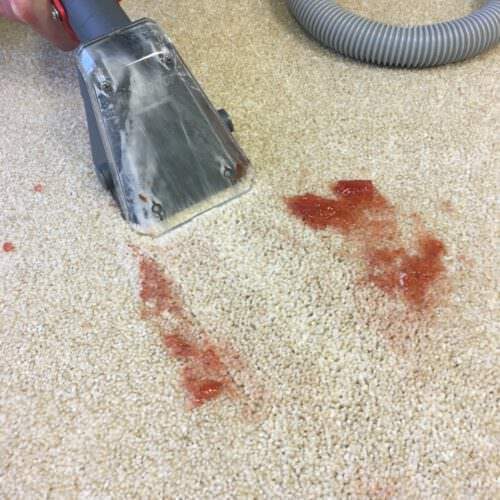 While the Rug Doctor cleaning machine is great for all carpet stains, it might be overkill for minor marks. 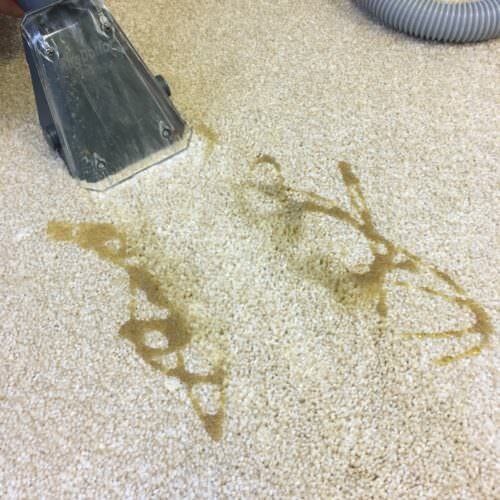 If you don’t need the full force of a Rug Doctor machine, our Portable Spot Cleaner is ideal for stain extraction. Our Spot and Stain Remover Wipes are also handy for cleaning up small spills. Chosen by 12% of people, perhaps a topping of ice cream isn’t quite so ‘á la mode’ when it comes to pancakes. 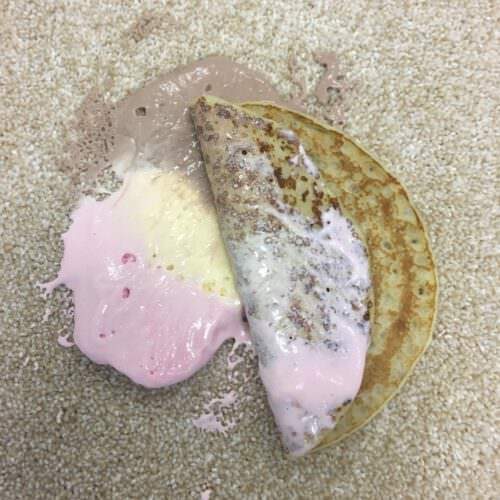 Still, should you want something frozen on your pancakes, what’s the risk of ice cream? Cream comes from milk, which is protein-based. This is what you’d call a protein stain. It’s important not to apply heat to a protein stain. 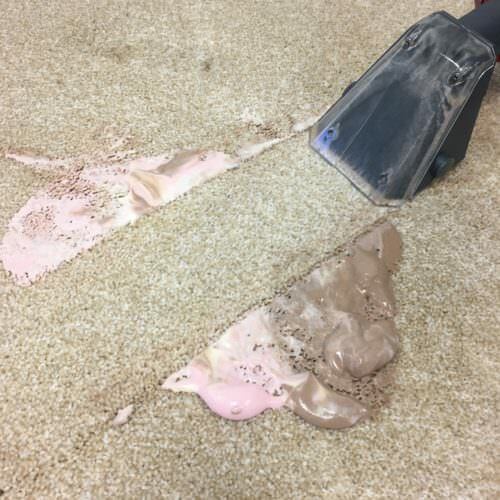 Heat can cause the proteins to curdle, cooking them into your carpet and making the stain harder to remove. When using a Rug Doctor machine, we recommend filling the tank with nine litres of warm tap water. Do not use water that is hot enough to burn or scald the skin. For wool carpets, take care to only use lukewarm water. Do you enjoy eating your pancakes in front of the TV? Don’t let ice cream drips spoil the furniture. 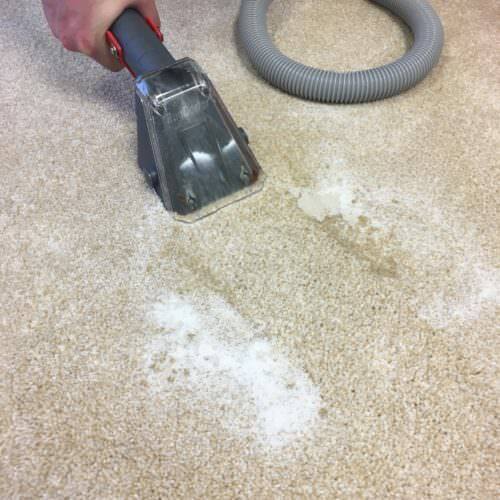 Our Oxy Power Fabric Cleaner can be used with the Rug Doctor hand tool to extract the stains. We know how popular chocolate spreads like Nutella™ are with kids. If you’re a parent, you face the very real prospect of having to remove this from your carpet. Chocolate stains are also darker than syrups, leaving a more dramatic mark. Some home cleaning websites suggest the use of white vinegar to lift stains like this. However, the BICSc were quick to set the facts straight! If you need to get rid of chocolate spread, why not reach for a bottle of our Spot and Stain Remover instead? First, remove any excess solids from the area to ensure you don’t spread the stain further. Then spray away, lightly agitating the stain from the edges towards the middle. Blot away the stain and repeat as needed. Rinse with water and blot to dry. To round off our list of popular toppings, jam combines the stickiness of syrup with the deep pigment of berries. But just how does it cause carpet stains? ‘Cross-linking’ means that the pigment of the berries forms a strong bond with the fibres of your carpet. This is how jam can create bold, vibrant stains that stick around. You can treat a jam mark as you would most other sticky stains. First, scrape away the excess. 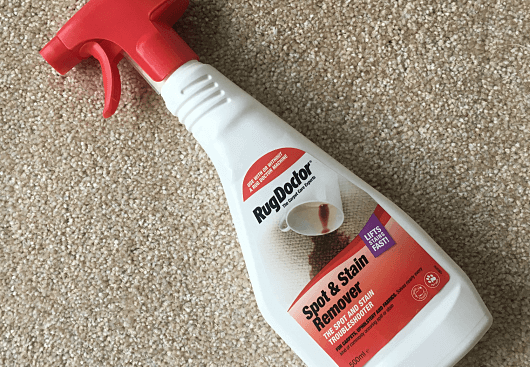 Then apply and gently agitate using some Rug Doctor Spot and Stain Remover. We reached for the Rug Doctor hand tool, and the results speak for themselves! Next time you’re in a jam, you know which Doctor to call! For severe stains, grab a bottle of Oxy Power Stain Remover. It disrupts the chemical bonds of stains, leaving them colourless. Remember, Rug Doctor machines are at the ready to rent or buy for all your post-pancake cleaning needs. 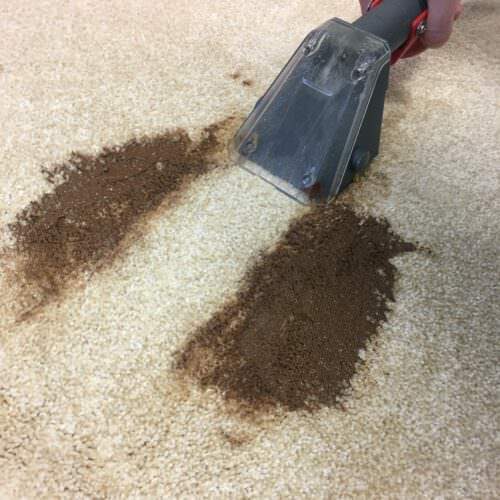 By cleaning deep into the carpet fibres, they do more to clear dirt and grime than a vacuum or spot clean. Just remember – if you stick a pancake to your kitchen ceiling, you’re on your own! 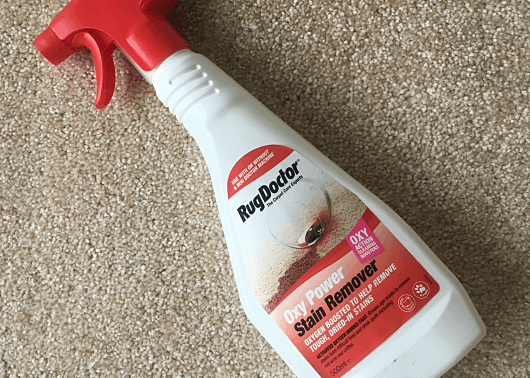 This entry was posted in Carpet Cleaning Tips, Stain Remover, Hacks. Bookmark the permalink.